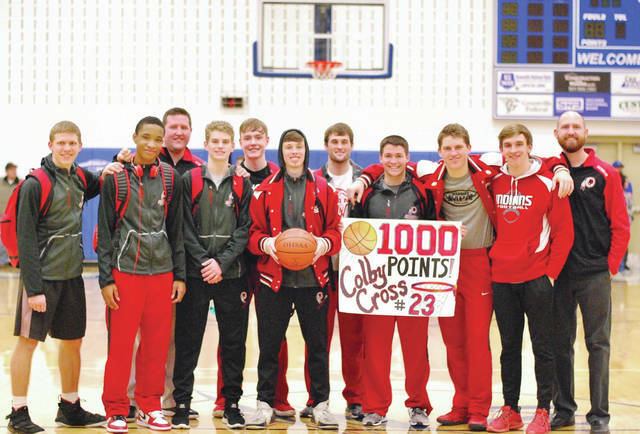 Cedarville junior Colby Cross (holding the ball) poses with his teammates and coaches after scoring his 1,000th career point in dramatic fashion, a 51-50 Indians win over Franklin Monroe, Jan. 26 in Arcanum. Cross has now scored the winning basket in the last two Cedarville boys high school basketball games. The Indians have now won five of their last seven games and are currently second in the Ohio Heritage Conference’s South division.